Information about what we should eat and drink to enhance our wellness is confusing. Seemingly every week we’re bombarded with a new directive as to what a healthy diet should or should not include. A new book finally puts the kibosh on faulty information we have long been told about the advantages of a low-fat diet. In fact, it turns out, our bodies need certain fats to maintain optimal health. There’s a war going on inside this country. However, this one doesn’t involve militarized police kicking down doors and shooting innocent people or even the propaganda war that’s being waged to control your thoughts. This fight is over your health—more specifically, what you’re being told is good to eat in order to ensure optimal health. It’s evident that regular Americans are losing this battle, because for too long they have followed the advice of the medical and dietary experts who have argued that eating fat-free foods is the only path to good health. Thankfully, though, new research is validating what many health advocates have been saying for years: Your body needs fat to function, and if you want to lose weight and live a long and healthy life, then eat more fat. Sally Fallon Morell, the founder and president of the Weston A. Price Foundation and owner of PA Bowen farmstead in Brandywine, Md., has long said that human beings need to eat healthy fats to achieve peak health. Her new book, titled Nourishing Fats: Why We Need Animal Fats for Health and Happiness*, makes just this case, arguing cogently that fat-free margarines and certain vegetable oils are not just making people fat and unhealthy, they’re actually killing us. Mrs Morrell also maintains her own “Nourishing Traditions” blog on health and nutrition. Listen to AFP’s interview with Sally Fallon Morrell by clicking the link below. Now, an editorial published in The British Journal of Sports Medicine by several leading cardiologists states: “It is time to shift the public health message in the prevention and treatment of coronary artery disease away from measuring serum lipids [cholesterol] and reducing dietary saturated fat. Coronary artery disease is a chronic inflammatory disease, and it can be reduced effectively by walking 22 minutes a day and eating real food.” The real food they’re referring to consists of full-fat milk and other once-maligned foods that your parents and grandparents ate. It’s no wonder the average person is totally confused by this. It’s also no wonder obesity rates are through the roof. Mrs. Morell’s farm is only a few miles up the road from this editor’s house. She sat down with me recently to discuss her book as well as her tireless work to educate Americans on healthy living. Her views are devastating to the medical and dietary establishment, arguing that animal fats are not just not bad for you—they actually are vital for the human body to function. Mrs. Morell told AFP, “What’s in the animal fats are nutrients we can’t get anywhere else—vitamins A, D, and K—that are absolutely critical for our health.” Her book contains nearly 30 pages of footnotes that cite scientific research studies and books proving that animal fats are healthy for the human body. AFP is carrying Mrs. Morell’s book, Nourishing Fats, which also includes 35 pages of healthy recipes. To put it simply, if you want to be healthy and live a long, happy life, give up the fad diets and the refined and processed foods and go back to eating real food. You’ll lose weight and feel better, and you’ll get to eat amazingly well, too. 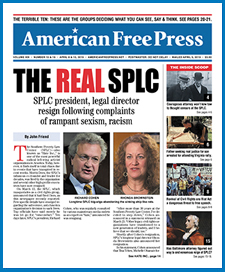 Christopher J. Petherick is the editor-in-chief of American Free Press and has a small farm in historic Southern Maryland. *Nourishing Fats: Why We Need Animal Fats for Health and Happiness (softcover, 272 pages) is available from AFP’s Bookstore for $25. Call AFP toll free at 1-888-699-6397 to charge or send payment with form on page 16 to AFP, 16000 Trade Zone Ave., Ste. 406, Upper Marlboro, MD 20613. See more books and videos online at the AFP Bookstore.